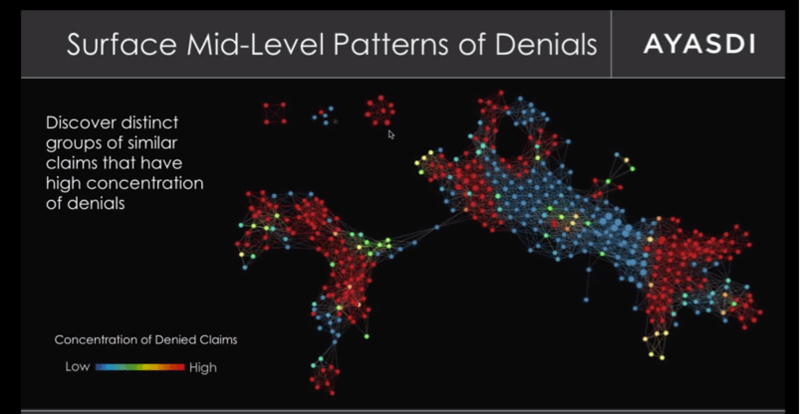 To understand the chronic problem with denials, you need to understand the middle. Most revenue cycle management leaders start at the top or at the left or in the upper right hand corner – and that is fine, but to move the needle you need to win in the middle. The top 100 hospitals have average revenues of $4.18 billion. High performing organizations post an average denial rate of 3.8%. This means that denials impact $158 million of revenue per year. Industry stats suggest that 35% of those are reworked successfully or $55 million recovered successfully. That rework costs about $1.1 million. Still, very worthwhile. But what about the other 65%? The other 65% is worth, sit down now, $103 million per year per hospital in the top 100. Let’s say that again, $103 million PER YEAR. By all industry estimates it is not getting touched. How is that possible? It’s possible because the effort to touch it is so great as to suggest that it is not worth the effort. There are patterns that can be found using pivot tables or simple statistics and they are the low hanging fruit. Call that 20% of the problem. You need talent to find these problems, Excel wizardry helps, but after one or two factors (a payer + a HCPCs code) the rest of the world looks featureless – like individual claims that need to be manually wrestled to the ground. A popular RCM outsourcing company’s “success story” headline declares that they “battled for appeal on A denied healthcare claim” worth $25K. The secret is that they are not individual claims – they are groups of claims, worth millions of dollars, but they lack an actionable definition. When you find the patterns that define those groups you now have something your operations team can action. The challenge is that the number factors that make up a mid-level actionable pattern start at 3 or 4 and go well past 10. The combinatorial complexity associated with that type of problem is immense. To accurately write the query above would entail consideration of 16 billion possibilities. That’s a lot of SQL. If you can solve for this you can really move the needle on the $103 million in untouched denials. We think 65% is addressable using machine intelligence approaches that find subtle patterns of similarity in the data. It is there, hiding in plain sight. We think we have the answer. It is field proven and leverages Topological Modeling to find these patterns of similarity. If you run a RCM function at a health system we should talk – even if you don’t think we are a fit, you will have far more insight into the nature of the middle and why it matters. Drop us a note at brand@ayasdi.com and we can go from there.